How can you make a real difference in the world and make a good living at the same time? The ECO Guide to Careers That Make a Difference: Environmental Work for a Sustainable World provides the answer. 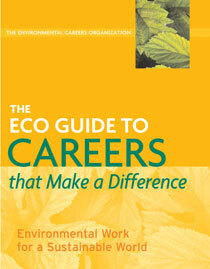 Developed by The Environmental Careers Organization (ECO, the creators of the popular Complete Guide to Environmental Careers), this new volume is unlike any careers book you've seen before. Reaching far beyond job titles and resume tips, The ECO Guide immerses you in the strategies and tactics that leading edge professionals are using to tackle pressing problems and create innovative solutions. To bring you definitive information from the real world of environmental problem-solving, The ECO Guide has engaged some of the nation's most respected experts to explain the issues and describe what's being done about them today. You'll explore: Global climate change with Eileen Claussen, Pew Center for Global Climate Change; Biodiversity loss with Stuart Pimm, Nicholas School for the Environment at Duke University; Green Business with Stuart Hart, Kenan-Flager Business School at University of North Carolina; Ecotourism with Martha Honey, The International Ecotourism Society; Environmental Justice with Robert Bullard, Environmental Justice Center at Clark Atlanta University; Alternative Energy with Seth Dunn, Worldwatch Institute; Water Quality with Sandra Postel, Global Water Policy Project; Green Architecture with William McDonough, McDonough + Partners; and twelve other critical issues. To demonstrate even more clearly what eco-work feels like on the ground, The ECO Guide offers vivid "Career Snapshots" of selected employers and the professionals that work there. You'll visit government agencies like the USDA Forest Service, nonprofit organizations like Conservation International and Project Wild, and local advocates like Alternatives for Community and Environment. You'll go inside environmental businesses like Wildland Adventures and Stonyfield Farms. And you'll learn from academic institutions like the National Center for Atmospheric Research and the Gund Institute for Ecological Economics. ECO also identifies and describes forty specific jobs that are representative of environmental career opportunities in the twenty-first century. It provides dozens of the best Internet resources. And most importantly, The ECO Guide offers all of the insight about current trends you expect from ECO, the acknowledged leaders in environmental career information.